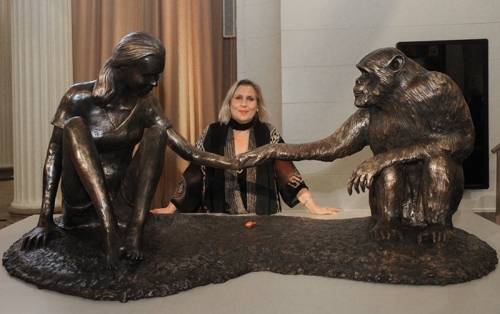 Ms. Friedman’s oeuvre of public and private installations includes her latest project, the lyrical narrative monument sculpture of primatologist Jane Goodall and the famous Gombe chimp David Greybeard. In collaboration with and inscribed by Dr. Goodall, The Red Palm Nut is now on permanent display at the Field Museum of Chicago. Other commissioned works include the powerful rendering of Dr. Maya Angelou, sanctioned by The Caged Bird Foundation and her regal portrait sculpture of Abraham Lincoln for the Abraham Lincoln Presidential Museum and Library Foundation. Ms. Friedman was chosen by the Apollo 13 astronaut Captain James Lovell to sculpt his likeness. The striking sculpture, in collaboration with and inscribed by Captain Lovell, is permanently exhibited at his namesake hospital. Such historic icons as Rosa Parks, Julius Rosenwald and Booker T. Washington have also been subjects of the artist’s impressive body of work. Embracing the subtlety of expression in her art, Friedman has a masterful ability to authentically reproduce the sitter’s physical form while simultaneously capturing the essence of a persona. Influenced by the French Realist tradition, Friedman developed a solid foundation in two dimensional portraiture at the Art Students League and the National Academy of Design in New York City, independent study in Italy and France and L'Ecole Albert Defois in the Loire Valley, France. Self taught in sculpture she approaches clay with the confidence of history and the freedom of an autodidact. Intuitively delving directly into the medium, Friedman engages the subject to join her in a creative, collaborative experience. Her sensitive, nuanced renderings in clay are wondrous. Cast in bronze they are powerful timeless treasures; a tangible, tactile record of life.